Pick up point: Please take your voucher/confirmation to one of the below exchange points for your tickets:	The Original Tour Visitor Centre in Trafalgar Square: 17 to 19 Cockspur Street. Marble Arch: Subway exit 4 at Speakers Corner. Piccadilly Circus: Opposite Shakeshack on Coventry Street (across from the M&Ms World Store). Victoria: Outside The Belgravia Centre on Grosvenor Gardens. Important info: Pushchairs and prams can be carried on buses, but must be folded before boarding they can be stored in the wheelchair space providing that it is not occupied by a wheelchair user. Unfolded pushchairs cannot be transported on buses unfortunately.In order to gain entry you must present a printed copy of your voucher. 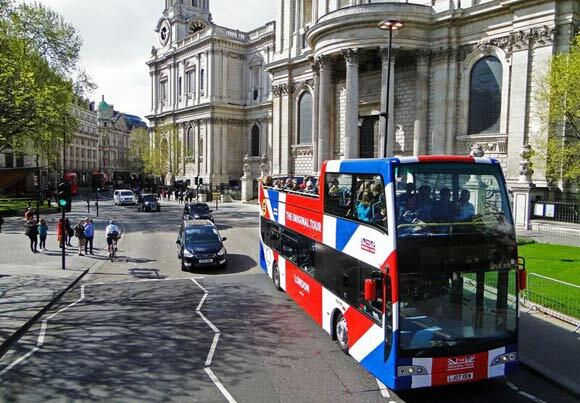 What better way to experience the many sights and sounds of London than from an open top bus, but with the added flexibility of being able to jump off at one of the many stops to explore further and then jump back on to continue your tour. With a live English commentary as well as a selection of eight languages on selected routes visitors will be guided through the stunning architecture and fascinating history of this exciting city. With the tickets being completely unrestricted you can explore at your own pace enjoying the attractions that interest you the most and with departure points close to many of Hotel Directs many hotel locations and 80 stops along the route you can really make a day of it. Originally introduced in 1951 as the Service J for the festival of Britain, thousands of visitors were carried on a nonstop circular tour with a free London Transport guide book to help identify the sights as they passed them. The tour was expanded in the 1970`s to include a guide who would be able to pass on local knowledge to the visitors and due to demand from foreign tourists a range of pre-recorded audio guides were added in 1984 and expanded in the 1991. With many cities offering guided tours they can all be traced back to the Original Tour which set the precedent for multilingual guides around the world. It was also the first service to offer the ability to hop on and hop off to make the most of the fantastic attractions it toured.